I’ve always been a fan of Johnny Cash. As my musical tastes changed from being primarily country to, by the end of High School, being more Rock/Alternative and then broadened again to include bluegrass, folk and americana during college and after, Cash was always there. As a measure of Cash’s genre and social-crossing ability his death had been mourned by many younger artists of the music industry–perhaps in their heart the recognize the sincerity in Cash’s music that is lacking in their own–and by Christians who I think see in him a person who represents the truth of sainthood. To quote a line from another great country singer, George Jones “The only thing different between sinners and saints is one is forgiven and the other one ain’t.” The truth of Johnny Cash–why he could move from singing lines like “I shot a man in Reno just to watch him die” to singing Just a Closer Walk with Thee or Old Rugged Cross and convey sincerity with both and faith with the latter–is that he recognized that he was a sinner and, especially later in his life, that he was forgiven by the grace of God shed abroad through the Cross. Copyright (c) 2003 First Things 138 (December 2003): 6-9. In the world of popular music, one generally becomes a “legend” only in death—as if death accomplishes for a musician all that he was unable to do for himself in life. Legends are often made in the manner of their death—in a helicopter crash, say, or collapsed on the bathroom floor. 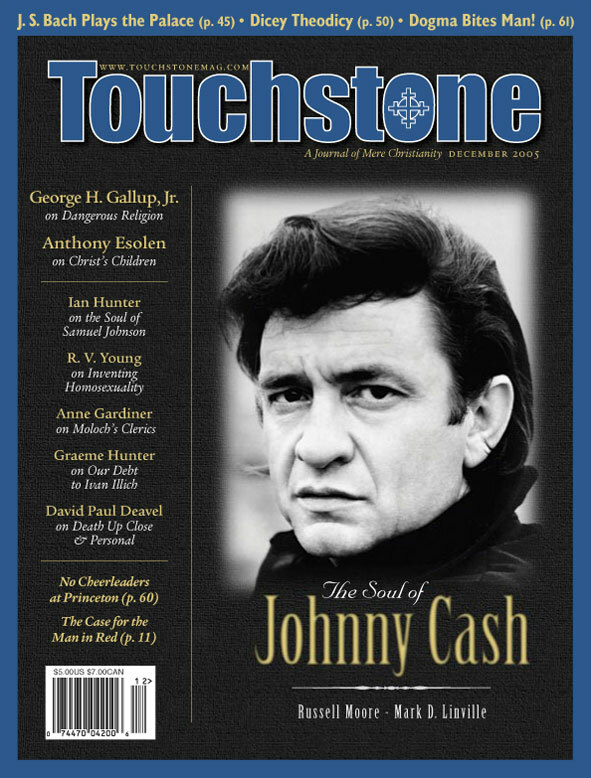 But Johnny Cash’s death at seventy-one on September 12 was decidedly un-legend-like: silent, slow, and unspectacular. Yet “legend” seems, if anything, not big enough a word to describe Johnny Cash. We all knew the end was coming, particularly after June Carter, to everyone’s shock, beat him to it. But the impact of the news was not thereby diminished. On that Friday we lost possibly America’s most singular individual. I don’t think that it’s too much of a stretch to say that in Johnny’s death a little bit of what is best about America died, too. The only word that seems to suffice here is magnanimity. The OED defines it poetically: “In Aristotle’s sense of megalopsuchia . . . loftiness of thought or purpose, grandeur of designs, nobly ambitious spirit. Now rare.” That was Johnny Cash: great-souled, rare. Everything about him was as big and black and broad as the Arkansas delta, from his physical stature and persona to “that” voice. Yet his life cannot be reduced to a metaphor. It was more than just one of noble ambition or grandeur of design; Johnny’s virtues were just as hard-fought as his vices. In life Johnny Cash struggled for and against the God whose grip on him was so frustratingly and thankfully relentless that it was able to absorb all that fierce rage and all those addictions. Johnny could sing about murder and God in the same song and with the same voice because to do otherwise would have been dishonest. At the same time, he let that despair, agony, and rejection stand on their own—he lent them integrity. There was no serious salvation unless there was first some serious sin. Cash echoed St. Paul: “It is hard for thee to kick against the pricks.” But there is at least one thing that Cash never was, and that is a moralist. He did not chalk doubt up to a misunderstanding. Rather, Cash showed that doubt is itself proper to faith. A God who could not stomach the darkest moments of His creation was not worth our worship, much less a song. That’s because he lived, sang, and played truthfully. There was in him no hint of fraud. At a time when he could have resurrected his career by riding the coattails of others’ popularity (as is the trend today), Johnny did the reverse. On 1994’s American Recordings (on the cover he stands in a field wearing a long black preacher’s coat, alone except for two dogs), he did not simply return to the “old” Johnny Cash and commodify himself for a younger audience. Rather, he signed with a punk label and sang about his familiar subjects, but this time with no musical accompaniment beyond his own acoustic guitar. All kinds of audiences ate it up because they recognized that in a world full of fakes, Cash was authentic. There are so many aspects to Cash’s career that are unmatched in popular music. He is the only person to be inducted to the respective halls of fame for rock musicians, country artists, and songwriters. Possibly more striking than the body of songs he left us are the songs written by others that he covered. In this sense, a song like “The Mercy Seat” was a Johnny Cash song all along, as if its author, Nick Cave, just tended to it until it found its true voice. This is not to denigrate the original—far from it. Rather, some songs transcend their own authors in such a way that they can only be sung by a particular voice. This was literally the case with “The Wanderer,” a U2 song that the band’s lead singer, Bono, penned and tried to record. He finally gave up, admitting that the only person who could sing the lyrics was Johnny. Does the needle deliver heroin or an IV? A narcotic or a painkiller? When Cash recorded “Hurt” in 2002, he had already been suffering from a variety of ailments for several years. There is a poignancy to his frank confession of the reality of pain that rings all the truer for his having sung it. Critics did not regard the later editions of the American series with the same awe that they did the first. The last one he released while still alive, American IV: The Man Comes Around, was well-received, but some critics wondered why we needed another version of standards like “Give My Love to Rose.” We needed it because, when sung by a seventy-year-old and frail Cash, it is a very different song than the same tune sung by the same man at age twenty-four. For now the character in the song who lies at the side of the railroad tracks is very much Cash himself. For this reason American IV actually has more coherence and power than his previous two releases in the series. Every song on the record is about death—the title track, “I Hung My Head,” “We’ll Meet Again.” What is “Danny Boy,” after all, but a funeral dirge? It is precisely here that Cash’s final years were in some ways his greatest. On his final album, he was teaching us how to die. And in a culture that by and large loves death but does not know what to do with it—a culture simultaneously repulsed and attracted by it—Johnny’s confrontation with his own imminent demise was largely misunderstood. The critics who complained that his voice was not what it used to be missed the point entirely. It is precisely because his voice was not what it used to be that the songs have such power. The beauty of the record lies in that very frailty, the tremolo in his voice that became more pronounced with each album. Even in his younger days, the inimitable strength and fortitude in his voice was mixed with the occasional moment of weakness, the odd quaver and show of vulnerability. In the last few years those moments became more frequent, and his voice became more diaphonous, disclosing more of the effects of illness. Yet for that very reason, Cash’s voice was all the more beautiful—it had a weakness stronger than others’ strengths. Nowhere is this more clear than on the music video for “Hurt,” directed by Mark Romanek. As with most of the songs on American IV, the vocals for “Hurt” were recorded dry—without the use of reverb, delay, or other effects. That in itself is remarkable, because recording a voice that way reveals all the idiosyncrasies and flaws that a digital effect might otherwise cover up. Nowadays almost no one records vocals this way. The unadorned character of the voice is echoed visually in the film by Cash’s refusal to conceal, with the use of makeup and other gimmickry, the fact that he is dying. No attempt is made to shoot his face from the most flattering angle, no effort to shun the ravaged face of a once indomitable figure now consumed by disease. Towards the end of the video, the song crescendos to an intense height, accentuated by the repetition of a single note on the piano. Superimposed on all of this is a rapid montage of footage from Cash’s prime, when his hair was still black and his jaw still square. Juxtaposed beside flashes of his successes are images of the Cash museum in a state of disrepair, broken shards of those successes whose significance is now altogether subverted by the figure of Cash himself, sitting at the head of the festal table. And in between visions of the spry young superstar and the remnants of fame is the recurring image of the crucifixion. The climax of the film comes when Cash, with a crystal goblet full of red wine lifted and trembling in his enfeebled right hand, turns the cup over and empties its contents over the table, baptizing the sumptuous banquet laid out before him. Johnny Cash died in a way that demonstrated what it might mean to die well. Unlike those who die quickly, he was graced with the company of friends and loved ones, yet he never used his illness as a pretense or a front. His end was slow, painful, marked with tremendous accomplishments (even for a healthy person), but he drew near it honestly and unsentimentally. His spirit was scarred, busted, threadbare, but fearless, peaceable, witty and wise. In his living, playing, loving, and singing, he also sounded out the timbre of the Christian faith and showed how it ought to be lived: stammeringly, tunefully, with no overdubs and no effects. But most of all, with soul. There was an empty seat at this year’s MTV Music Video Awards. The late Johnny Cash wasn’t there. It’s not as though Cash frequented the Generation X/Y annual awards program. He was old enough to be the grandfather of the most seasoned performer on the platform. Still, two years ago, even while he was sick in a hospital, the Man in Black was there. At the 2003 awards show, Cash’s video “Hurt” was nominated for an award—up against shallow bubblegum pop acts such as that of Justin Timberlake. Cash didn’t win. But the showing of the video caused an almost palpable discomfort in the crowd. The video to the song, which was originally performed by youth band Nine Inch Nails, features haunting images of his youthful glory days—complete with pictures of his friends and colleagues at the height of their fame, now dead. Whereas Nine Inch Nails delivered “Hurt” as straight nihilism, straight out of the grunge angst of the Pacific Northwest’s music scene, Cash gives it a twist—ending the video with scenes of the crucifixion of Jesus. For him, the cross is the only answer to the inevitability of suffering and pain. “It’s all fleeting,” he told MTV News. “As fame is fleeting, so are all the trappings of fame fleeting; the money, the clothes, the furniture.” This could not be in more marked contrast to the culture of the popular music industry (whatever the genre), a culture of superficiality, self-exaltation, and sexual libertinism. Perhaps this is the reason Cash remained—to the day of his death—a subject of almost morbid curiosity for a youth culture that knows nothing of “I Walk the Line.” At the 2003 awards show, 22-year-old pop sensation Justin Timberlake, beating Cash for the video award, demanded a recount. Why would twenty-something hedonists revere an old Baptist country singer from Arkansas? The prison imagery seemed real to Cash because, for him, it was real. He knew what it was like to be enslaved, enslaved to celebrity, to power, to drugs, to liquor, and to the breaking of his marriage vows. He was subject to, and submissive to, all the temptations the recording industry can parade before a man. He was a prisoner indeed, but to a penitentiary of his own soul. There was no corpse in Reno, but there was the very real guilt of a lifetime of the self-destructive idolatry of the ego. There’s a man goin’ ’round takin’ names. An’ he decides who to free and who to blame. Everybody won’t be treated all the same. There’ll be a golden ladder reaching down. When the man comes around. Hear the trumpets, hear the pipers. One hundred million angels singin’. Multitudes are marching to the big kettle drum. Voices callin’, voices cryin’. Some are born an’ some are dyin’. It’s Alpha’s and Omega’s Kingdom come. Listen to the song. And thank God for his grace and for people who recognize it like Johnny Cash.